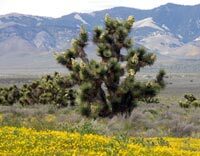 The arrival of spring always means wildflowers in California's Antelope Valley, the broad plateau between the Tehachapi and San Gabriel Mountains about 70 miles north of Los Angeles. 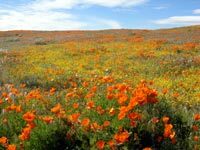 This year, the record rain storms in southern California have caused mudslides, but they have also fueled once in a lifetime displays of wildflowers in Death Valley and an intense bloom of California poppies. From downtown Los Angeles, we drove west on highway 101 and then began the climb over the formidable San Gabriel mountains to join Interstate 5 near CA-14. Passing the eye-catching erector set roller coasters at Six Flags Magic Mountain, we climbed the ridge past Castaic Junction and Pyramid Lake to the exit at Gorman School Road. 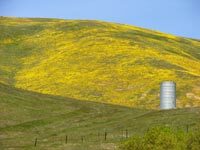 In past years on wildflower explorations, we have found snow on the slopes here, but this year, the overwhelming impression of the area is the incredibly verdant grass and other plants covering on the steep hillsides surrounding Gorman. 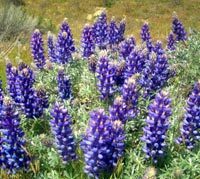 Some of the poppies and purple lupine are just beginning to appear, but it was still a little early for the grand floral display, so we headed east on Gorman Post Road and turned left on CA-138 (Lancaster Road). Off to the north, we could see fields of yellow, so we turned north on 300th Street West and headed for the distant fields. It rapidly became apparent that A LOT of water had been flowing down the dirt roads in recent weeks, as we slowed to gingerly cross the ruts and wash-outs in the roadway. The yellow flowers turned out to be yellow fiddleneck, but since we were looking for California's state flower, the California Gold Poppy, we headed east on Gaskell Road. It wasn't long before we saw the first clumps of this gorgeous wildflower and patches of contrasting purple Notched-leaf Phacelia. The most surprising find in this section of the valley was the Joshua Tree forest around 225th Street. 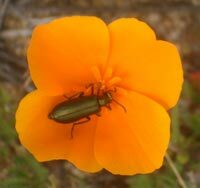 Looking towards the southeast, we could see intense fields of orange poppies near the California Poppy Reserve. At 170th, we turned south and headed for the state park. 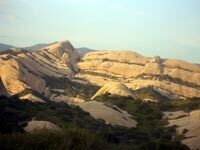 The park features about seven miles of hiking trails with paved sections to accommodate wheelchair visitors. The park is located at 15101 W. Lancaster Road (which is another name for Avenue I). As in past visits, we noticed that the majority of poppies were blooming in fields outside the park, and we pressed onward looking for the best displays. By far, the best displays of the day were found just to the east of the state park. 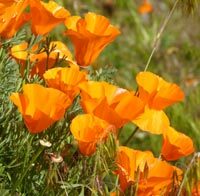 Here we found wonderful fields of the elusive yellow poppy, cream cups, goldfield, and acres and acres of the bright orange California poppies. On our return to Los Angeles, we continued to the east, passing through the downtown district of Lancaster before returning to CA-138, which is also known as the Pearblossom Highway. We followed it to Mountain Top Junction. Here we turned south on CA-2 and traveled up to the alpine village of Wrightwood. Racing the approach of darkness, we turned east on Lone Pine Road and drove down San Andreas Rift Zone (a very active geological area) and managed to reach the exotic rock formations known as Mormon Rocks just in time for the raking sunset sun. From there we joined Interstate 15 and headed back to Los Angeles. From Los Angeles International Airport (LAX) Interstate 405 north 23 miles to Interstate 5 and continue north on I-5 about 43 miles to the Gorman School Rd. exit.